This article is about the 1994 film. For the 1961 horror film, see The Mask (1961 film). For the 1985 film, see Mask (film). The Mask is a 1994 American superhero comedy film directed by Charles Russell, produced by Bob Engelman, and written by Mike Werb, based on the comic series of the same name published by Dark Horse Comics. The film stars Jim Carrey, Peter Greene, Amy Yasbeck, Peter Riegert, Richard Jeni, Ben Stein, Joely Fisher, and Cameron Diaz in her film debut. It revolves around Stanley Ipkiss (Carrey), an unfortunate bank clerk who finds a magical mask that transforms him into a mischievous zoot-suited gangster. The film was released on July 29, 1994, by New Line Cinema, becoming a critical and commercial success, grossing over $351 million over a $23 million budget. It cemented Carrey's reputation as a dominant actor of the 1990s, and established Diaz long-term as a leading lady. Carrey was nominated for a Golden Globe for his role, and the film was nominated for the Academy Award for Best Visual Effects but lost to Forrest Gump. A critically panned stand-alone sequel, Son of the Mask, was released in 2005. Stanley Ipkiss (Jim Carrey), an insecure bank clerk working at the local Edge City bank is frequently ridiculed by everyone around him except for his co-worker and best friend Charlie Schumaker (Richard Jeni). Meanwhile, gangster Dorian Tyrell (Peter Greene), owner of the Coco Bongo nightclub, plots to overthrow his boss Niko (Orestes Matacena). One day, Tyrell sends his singer girlfriend Tina Carlyle (Cameron Diaz) into Stanley's bank to record its layout, in preparation to rob the bank. Stanley is attracted to Tina, and she seems to reciprocate. Unable to enter the Coco Bongo to watch Tina perform, Stanley finds a wooden mask near the city's harbor. Placing it on his face transforms him into a bizarre, wisecracking green-faced zoot-suited trickster known as "The Mask", who is able to cartoonishly alter himself and his surroundings at will. As The Mask, Stanley exacts comical revenge on his tormentors and scares off a street gang that attempts to rob him by turning a balloon into a Tommy gun and humiliates two repairmen who scammed him earlier. The next morning, Stanley encounters detective Lieutenant Kellaway (Peter Riegert) and newspaper reporter Peggy Brandt (Amy Yasbeck) investigating The Mask's activity of the previous night. To attend Tina's performance, he again becomes the Mask to raid the bank, inadvertently foiling Tyrell's plan in the process. At the Coco Bongo, Stanley dances exuberantly with Tina, whom he ends up kissing. Following a confrontation with Tyrell for disrupting the bank robbery and stealing his girlfriend, Stanley flees leaving behind a scrap of cloth from his suit that transforms back into his pajamas, while Tyrell and his men are arrested by Kellaway and his partner Doyle (Jim Doughan). Based on the piece of cloth, Kellaway suspects Stanley to be the bank robber. Stanley later consults a psychiatrist (Ben Stein) who has recently published a book on masks and discovers that the object may be a creation of Loki, the Norse god of darkness and mischief. The same night, Stanley meets Tina at a local park as the Mask, but the meeting is interrupted by Kellaway, who attempts to capture him. Stanley tricks a large group of police officers into joining him in a mass performance of the Desi Arnaz song "Cuban Pete" and flees with Peggy, but she betrays him to Tyrell for a $50,000 bounty. Using the mask, Tyrell becomes a malevolent green-faced monster. Tyrell's henchmen end up in the possession of the stolen money after Stanley is forced to reveal its location, and they turn Stanley into the police. When Tina visits Stanley in the station, he urges her to flee the city. Tina thanks Stanley for showing her kindness and warmth she wasn't used to and tells him that he didn't need the mask to be special to her. She attempts to leave the city, but is captured by Tyrell's men and forcibly taken to a charity ball at the Coco Bongo hosted by Niko and attended by the city's elite, including Mayor Tilton (Ivory Ocean). Upon arrival, the masked Tyrell kills Niko and prepares to destroy both the club and Tina with dynamite. Milo, Stanley’s dog, helps Stanley escape from the station by leaping in through the cell window to retrieve the keys from a guard, and Stanley brings Kellaway as a cover and hostage in a desperate attempt to stop Tyrell. After locking Kellaway in his car, Stanley enters the club and manages to enlist the help of Charlie, but is soon after discovered and captured. Tina tricks Tyrell into taking off the mask, which is recovered and donned by Milo, who fights Tyrell's men, while Stanley fights Tyrell by himself. After recovering the mask, Stanley uses its special powers to rescue Tina by swallowing Tyrell's bomb and flushing Tyrell down the drain of the club's ornamental fountain. The police arrive and arrest Tyrell's remaining henchmen while Kellaway attempts to arrest Stanley once again. However, Tilton tells Kellaway to release Stanley, believing that Tyrell was the Mask the whole time and Stanley only put it on this one time. Tilton calls Stanley a hero for his actions and states that he will have a "meeting" with Kellaway at dawn. As the sun rises the following day, all charges against Stanley are dropped. Not wanting to get involved with the police again, Stanley decides to discard the mask at the harbor. Tina throws the mask into the water, and she and Stanley kiss. Charlie then jumps in the water to retrieve the mask for himself, only to find Milo swimming away with it. 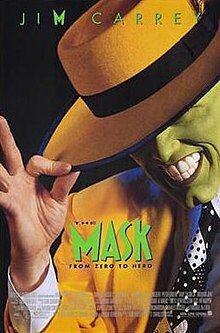 Jim Carrey as Stanley Ipkiss / The Mask: Jim Carrey, who portrays Stanley Ipkiss, commented that he characterized Stanley after his own father: "a nice guy, just trying to get by". When Ipkiss puts on the Mask, he becomes a wacky, zoot-suited, suave cartoon figure having the ability to manipulate his own shape and the world around him to a superhuman extent; this is implied to be the projection onto himself of his preferred fantasies. Peter Greene as Dorian Tyrell: A Mafia officer who desires to kill his superior. He is completely insane, psychopathic, manipulative, ambitious, arrogant, paranoid and selfish with scant regard for any of the lives destroyed or simply taken as a result of his media ambition. When Dorian wears the Mask, he becomes a troll-like figure representing his malice, and exhibits bestial behavior. Cameron Diaz as Tina Carlyle: The glamorous girlfriend of mobster Dorian Tyrell who is attracted to Stanley Ipkiss. Tina is largely dissatisfied with Dorian as a partner, but does not defy him until she has been courted by his rival. This role marked the feature film debut for former model Cameron Diaz. Before Diaz was cast, the studio considered casting Vanessa L. Williams and Kristy Swanson. There was also a studio offer for Anna Nicole Smith. Orestes Matacena as Niko: The mafia boss of Edge City and owner of the Coco Bongo Club. Peter Riegert as Lt. Mitch Kellaway: A slightly cynical police detective who pursues the Mask, Dorian and Niko throughout the film. Jim Doughan as Detective Doyle: Lt. Kellaway's slightly-inept partner. Richard Jeni as Charlie Schumaker: A friend of Stanley Ipkiss. Charlie is amiable, but can be selfish or irrational at times. Amy Yasbeck as Peggy Brandt: A reporter. Originally, the character was murdered by Dorian when he is first transformed by the Mask. Director Chuck Russell however, cut this scene with an eye to including Peggy who later reforms in a Mask sequel (though this idea fell through when Carrey declined to return). However, she appeared in the animated series. Jeremy Roberts as Bobby the Bouncer: One of Dorian Tyrell's bodyguards who works as the bouncer of the Coco Bongo Club. Ben Stein as Dr. Arthur Neuman: A psychologist who tells Ipkiss about the Mask being representative of a Norse Night God named Loki. He's also the author of a book, The Masks We Wear, which deals with people portraying themselves differently to others. Ivory Ocean as Mitchell Tilton: The Mayor of Edge City. Reginald E. Cathey as Freeze: Dorian Tyrell's bodyguard and a friend. William Daniel Mielcarek as Doc: One of Tyrell's thugs. Denis Forest as Sweet Eddy: One of Tyrell's thugs. Eamonn Roche as Mr. Dickey: Stanley and Charlie's supervisor at Edge City Bank. Nancy Fish as Mrs. Peenman: Stanley's temperamental land-lady. Nils Allen Stewart as Orlando: One of Tyrell's thugs. Blake Clark as Murray: Peggy's supervisor at the city's local newspaper. In 1989, Mike Richardson and Todd Moyer, who was Executive Vice President of Dark Horse Comics, first approached New Line Cinema about adapting the comic The Mask into a film, after having seen other offers. The main character went through several transformations, and the project was stalled a couple of times. One unused "Mask" idea, according to Mike Richardson, was to transform the story into one about a mask-maker who took faces off of corpses to put them on teens and turn them into zombies. Initially intended to become a new horror franchise, New Line Cinema offered the job of directing the film to Chuck Russell. However, Russell found the violence of the comic to be off-putting, and wanted the film be less grim and more fun than the source material. Mike Werb says Chuck Russell tapped him after reading his script for Curious George for Imagine. The two decided to turn The Mask into a wild romantic comedy. Mike Werb wrote his first draft of The Mask in less than six weeks, and less than two months later it was green-lit. According to Mike Verheiden, they had a first draft screenplay for a film version done back in 1990. Verheiden then wrote the second draft in early 1991, adding more humor, and that ended up being the only work he did on The Mask. After that the film went into development hell. The Mask's visual effects were handled by Industrial Light & Magic (ILM) and Dream Quest Images. The sequences in the film which involved computer animation were supervised by ILM animation director Wes Takahashi. There were a lot of VFX scenes that had to be cut for budget. The film was a box-office success, grossing $119 million domestically and over $350 million worldwide, becoming the second-highest grossing superhero movie at that time, behind Batman. The film also received positive reviews from critics, including Roger Ebert of the Chicago Sun-Times, who gave the film 3 out of 4 stars, noting Jim Carrey for his "joyful performance." The Mask is one of three films featuring Carrey (the others being Ace Ventura: Pet Detective and Dumb and Dumber) released in 1994 that helped launch the actor to superstardom; The Mask was the most successful of these three films both critically and commercially. The film is also notable for immediately establishing Diaz – previously a complete unknown – as a major star in Hollywood as well. It currently holds a 77% "Certified Fresh" rating (with an average rating of 6.4/10) on review aggregator website Rotten Tomatoes, with the consensus stating "It misses perhaps as often as it hits, but Carrey's manic bombast, Diaz's blowsy appeal, and the film's overall cartoony bombast keep The Mask afloat." On the television program Siskel & Ebert & the Movies, the critics gave the film "two thumbs up". Metacritic, which assigns a normalized rating out of 100 to reviews from film critics, gave The Mask a rating score of 56, indicating "mixed or average reviews" based on 12 reviews. The film was nominated for Best Visual Effects at the 67th Academy Awards, but lost to Forrest Gump. In addition, Carrey was nominated for a Golden Globe. Conversely, he was also nominated for a Razzie Award for "Worst New Star". The Mask: Music From the Motion Picture was released on July 26, 1994 on Chaos Records through Sony Music Entertainment. It features music from Xscape, Tony! Toni! Toné!, Vanessa Williams, Harry Connick Jr., Carrey himself and more. "Bounce Around" – Tony! Toni! Toné! "(I Could Only) Whisper Your Name" – Harry Connick Jr. The record label Epic Soundtrax released an orchestral score soundtrack to The Mask shortly after the original soundtrack's release. The score was composed and conducted by Randy Edelman and performed by the Irish Film Orchestra. The film was released on VHS and Laserdisc on January 18, 1995, (and later on DVD) by New Line Home Video. The VHS version included an interview between Jim Carrey and Space Ghost. It was later released on Blu-ray Disc on December 9, 2008. An animated television series was made, The Mask: Animated Series, and a video game for the Super Nintendo, The Mask, were both based on the film. After the success of the original, a sequel was planned, with magazine Nintendo Power offering readers a chance, via sweepstakes, to win a cameo role in the film. However Jim Carrey eventually bailed on the project, forcing, amongst other things, Nintendo Power to give the winner of the contest the equivalent cash value instead. A standalone sequel, Son of the Mask, not featuring both Carrey & Diaz, was eventually released in 2005, but it was a critical and commercial failure upon release. On the possibility of a third film, Mike Richardson has said, "We've been talking about reviving The Mask, both in film and in comics. We've had a couple of false starts." ^ "The Mask". British Board of Film Classification. Retrieved February 22, 2015. ^ a b c "The Mask (1994)". Box Office Mojo. Retrieved March 27, 2013. ^ Brennan, Judy (July 31, 1994). "'Mask' Makes Dark Horse Into Sure Bet for Spinoffs : The booming comic-book publisher gets a multi-picture deal before the Jim Carrey film even opens". Los Angeles Times. ISSN 0458-3035. Retrieved March 25, 2019. ^ Ching, Albert (20 October 2013). "NYCC: Palmiotti, Richie & Richardson Talk Comics and Hollywood". Comic Book Resources. Retrieved 9 September 2017. ^ THN Exclusive: Chuck Russell talks I Am Wrath, The Mask and Freddy Krueger Retrieved September 9, 2017. ^ Shapiro, Marc (August 1994). "Mask Maker". Starlog. No. 205. pp. 32–35. Retrieved 9 September 2017. ^ 'MASK' MASTERMIND: But Aren't All Screenwriters Former Teen-Age Geek Losers? Retrieved 9 September 2017. ^ a b An Interview with Face/Off Screenwriter Mike Werb Retrieved 9 September 2017. ^ Jankiewicz, Pat (September 1994). "Masks of Time". Starlog. No. 206. pp. 40–45. Retrieved 9 September 2017. ^ "Subject: Wes Ford Takahashi". Animators' Hall of Fame. Retrieved 14 June 2016. ^ Ebert, Roger (July 29, 1994). "The Mask". rogerebert.com. Retrieved 2006-08-01. ^ "The Mask (1994)". Rotten Tomatoes. Retrieved March 27, 2013. ^ Dreuth, Josh (2008-12-09). "Today on Blu-ray – December 9". Blu-ray.com. Retrieved 2009-01-03. ^ "Player's Poll Contest". Nintendo Power (77): 82–83. October 1995. ^ Ponce, Tony. "Meet the winner of Nintendo Power's The Mask II contest". Destructoid. Retrieved 8 September 2016. ^ Sunu, Steve (7 August 2014). "EXCLUSIVE: Richardson Details Dark Horse's "Itty Bitty Mask" Plans". Comic Book Resources. Retrieved 9 September 2017. This page was last edited on 9 April 2019, at 09:08 (UTC).